In 1994, Walmart acquired 122 branches in Canada, thus creating Walmart Canada. Throughout its 20 year history, Walmart Canada continues to grow, now with over 400 locations from coast to coast, employing 85,000 associates. Walmart as we know it today evolved from Sam Walton’s original vision of offering great value and great customer service. Inspired by the early success of his dime store, Walton’s 5 & 10, and driven by a desire to bring even greater opportunity and value to his customers, Sam opened the first Walmart in 1962 in Rogers, Arkansas. Walmart proved to be what the people wanted and as the store grew, so did Sam’s aspirations. Soon after Walmart began to expand around the world, and Sam’s fearlessness in offering lower prices and bringing Walmart’s value to customers set a standard for the company that lives on to this day. Thirty-two years later, Walmart acquired 122 Woolco stores in Canada and Walmart Canada was born. Throughout our 20 year history, Walmart Canada continues to expand with over 400 locations operating across the country and employing 85,000 associates. Sam Walton’s vision of saving people money so they can live better is the driving force behind everything we do. with the intention of helping customers save money to live better. The first Walmart store is opened by Sam Walton on July 2, 1962 in Rogers, Arkansas. Thirty-two years later, Walmart acquired 122 Woolco stores in Canada and Walmart Canada was born. Throughout our 20 year history, Walmart Canada continues to expand with over 400 locations operating across the country and employing 85,000 associates. Sam Walton’s vision of saving people money so they can live better is the driving force behind everything we do. with the intention of helping customers save money to live better. Walmart opens its 24th store, accounting for $12.7 million generated in sales! Walmart is officially incorporated as Wal-Mart Stores, Inc. The Walmart Foundation is established to make a positive impact in the communities Walmart serves. The first Walmart Supercentre is opened in Washington, Mo., combining general merchandise and a full-scale supermarket to provide a one-stop shopping convenience. Walmart opens its first Canadian store after acquiring the 122-store Woolco division of Woolworth Canada. Walmart Canada is ranked by Strategy Magazine as the best store for customer service and value for money. For the third year in a row, a Canadian store is selected as Walmart’s International Store of the Year. With more than 1.1 million associates worldwide, Walmart becomes the world’s largest private employer. Walmart Canada opens its first Supercentres in Stouffville, Ontario, London, Ontario and Ancaster, Ontario, offering fresh food combined with general merchandise for the broadest selection of products under one roof at unbeatable prices. Walmart Canada celebrates its 300th store opening! Walmart Canada launches its new, brighter logo and tag line: Save Money. Live Better. Walmart.ca is launched as a place for Canadians to shop at Walmart Canada online. 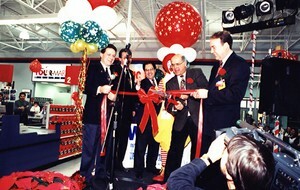 Walmart Canada celebrates its 20th anniversary in Canada. Walmart Canada launches Grocery Pickup in Ottawa, Ontario, allowing customers to order groceries online and pick them up at-store. Walmart Canada surpasses an incredible milestone of $100 million raised over 20 years in support of children’s hospitals across Canada through the Children’s Miracle Network. 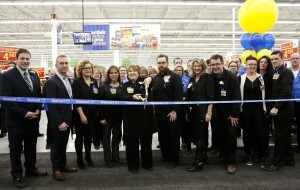 Walmart Canada opens 400th store and 300th Supercentre. Walmart Canada celebrates 10 years of fresh with over 80% of stores offering Canadians access to fresh, healthy food.